No, This Isn't Water. It's TRANSPARENT MILK TEA! Here's Where To Find It - EAT WITH HOP! You might think it's water. In fact, it really does look like water because it's clear. But right when you open that bottle, the trapped fragrant aroma of tea will rush out and travel to your nostrils. You feel tricked. Why is this clear liquid smelling like milk tea? You then take a sip. Your taste buds don't lie but you still can't believe it. THIS IS TRANSPARENT MILK TEA! And you realize that not everything is what it seems to be. BUT HOW!? WHAT IS THIS MAGIC!? This transparent milk tea actually is made from tea leaves and milk. So beware lactose intolerant folks, drink this with caution. But it is clear! Upon close inspection, if you compare it with actual water, you might notice that there is a "clear" (get the pun?) difference in the two liquids. Water is definitely much more clear but the transparent milk tea has tiny little condensation bubbles. I first heard of this from a Japanese beverage company called Suntory. In Japan, you can actually buy transparent teas, milk teas, and even clear coffee at the convenience stores. They are made by a popular company named "Suntory". Basically, water is boiled into water vapor. When this vapor passes through the tea leaves, it is infused with the aroma / flavor of the tea leaves. This vapor is then stored and cooled in a condenser with only clear liquid left behind! But what about the milk? Milk components can be divided into milk fat, milk protein, lactose and minerals. The lactose and minerals are clear, so Suntory extracts only those clear components to keep while leaving the fat and protein behind. This might cause the drink to lose the normal creaminess flavor you'd usually taste in milk teas. But the milk flavor is still there! You can read more here from the article I found on Suntory Transparent Teas. The Suntory brand is available in Japan, obviously, but you can also find it in Malaysia and Taiwan and other parts of Asia. But let's be real, I am an ORANGE COUNTY Food Blogguh so why would I recommend flying out all the way there? 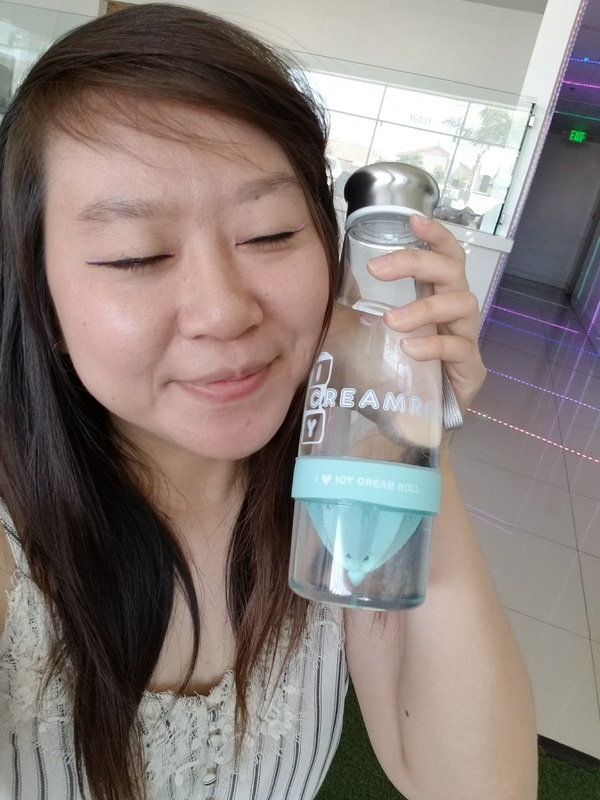 No worries folks, y'all can find transparent tea at a dessert shop called ICY CREAM ROLL! Note: I am not sure if Icy Cream Roll makes the drinks the same as Suntory, but I am sure it might be similar! When we visited the shop, Kevin noticed that the fridge had a few bottles of clear liquid. 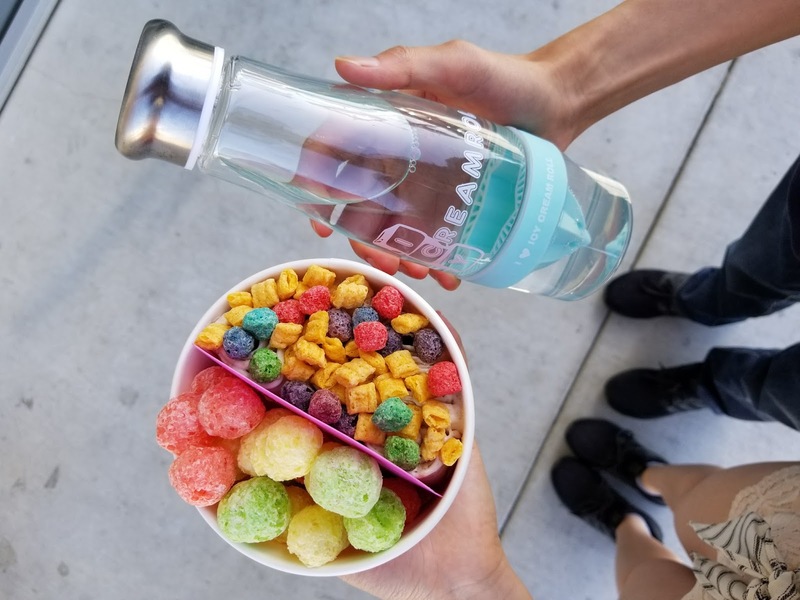 The infuser bottles at Icy Cream Roll are freakin` cute and practical and re-usable. The dessert shop sells handcrafted fruit tea lemonades and drinks and serves the drinks in those bottles. Why would they waste them by just containing water? No way could it just be water, Kevin thought. Later, after getting out ice cream, the owner handed us two of those bottles with clear liquid. 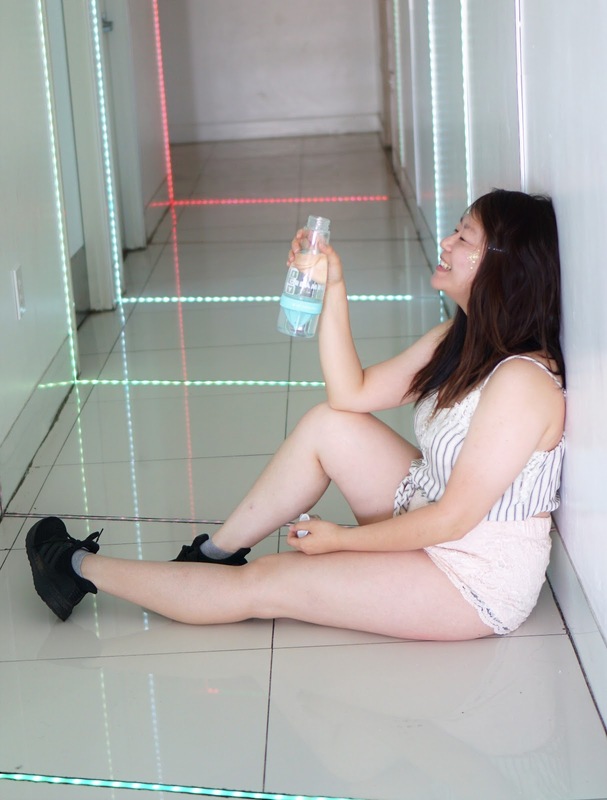 The owner revealed to us that it's their newest product: clear milk tea. WHAAAAAT!? 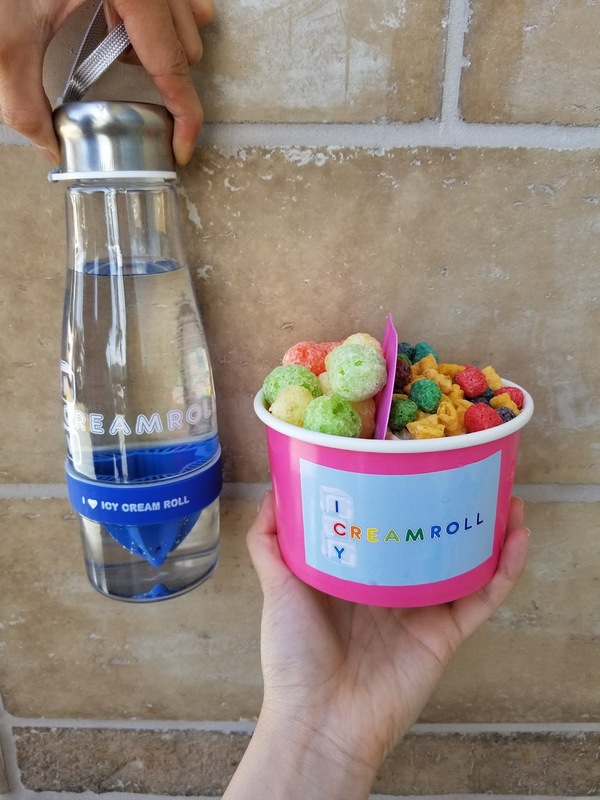 I've been wanting to try this type of drink for a long time, and so happy that Icy Cream Roll is bringing it over here to us Orange County foodies! I didn't know how to feel. I guess I was shocked, confused, curious, and excited. As I twisted the bottle cap open, immediately a sweet milk tea aroma escaped into the air. The smell was definitely that of tea, no doubt about it. 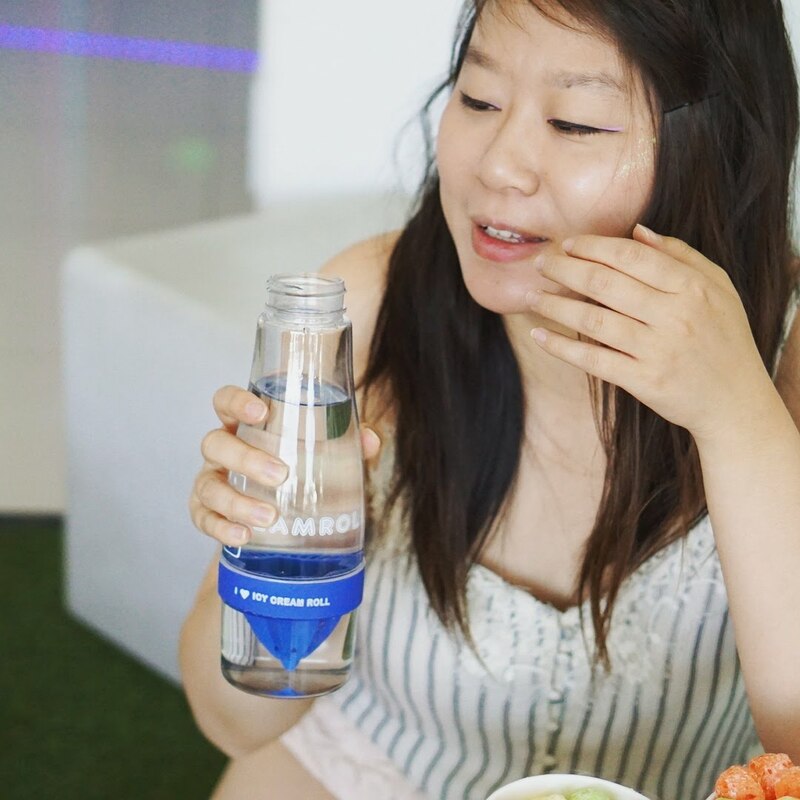 I poured the bottle into a cup of water (we recommend this served chilled) and took a sip. OMGAHHHHHHH THIS TASTES EXACTLY LIKE ROYAL MILK TEA. WHAAT! It actually tastes like milk + tea. Specifically, to me, it tasted like GOGOCHA brand (Japanese) Milk Tea (but a bit milkier) that used to be sold at Japanese markets nearby but the sale is now discontinued. I'd also say it tastes like Royal Milk Tea you get in Asia or at those very Chinese / Taiwanese boba shops that offer "Royal Milk Tea" or even those "Royal Milk Tea" aluminum cans. OG Photo from here. The Milk Tea pictured on the left is what I think it tastes like! The Crystal Milk Tea from Icy Cream Roll actually had a milky taste to it, which was so surprising. It's definitely better than all those canned/bottled versions I mentioned in the photos above because it tastes more milkier and tea-y. Probably because they are made in small quantities everyday (only 50 made) rather than bottled and canned. 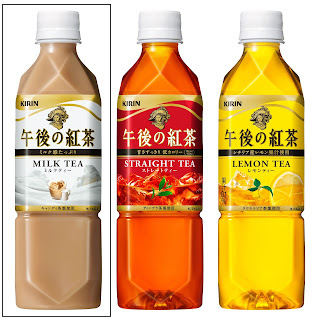 The videos and pictures I saw online about the Suntory brand transparent tea reveals that their drinks have a slight fogginess to it, so it isn't completely clear. However, the Icy Cream Roll's Crystal Milk Tea is actually very clear! Basically, exactly like clean water aside from a few bubbles that can be seen. In addition to my milk tea, I got cinnamon toast crunch ice cream with captain crunch toppings! omg I am in love with this!! The Crystal Milk Tea is the same price as the other drinks on the menu: $5.50. 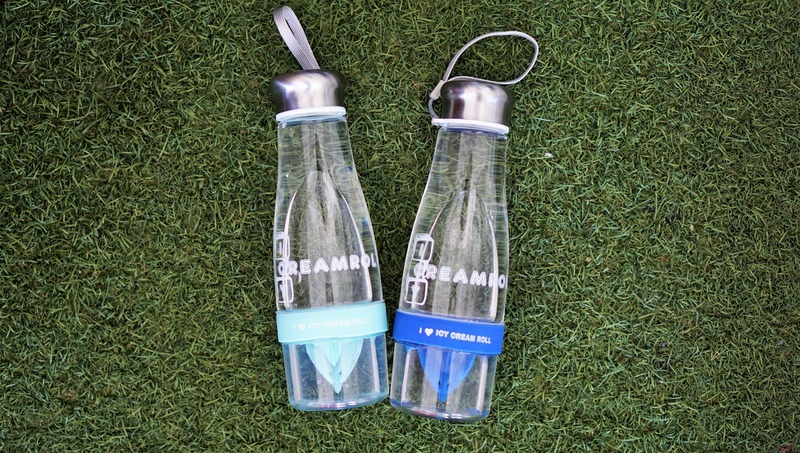 The drink automatically comes with the cute infuser bottle which is re-usable! I've reused my infuser bottle quite a few times and love making fruit water with it. They also sell ice cream rolls and icy breath where you can breathe like a dragon! Icy Cream Roll only makes around 50 of them a day. The Crystal Milk Tea will be available starting April 23, 2018 (Monday). Kevin and I really enjoyed it and recommend it to y'all! The drink doesn't come with any ice, so it is a bit on the sweeter side. I recommend drinking it over a cup of ice for that refreshing milk tea taste! It's a mind-blowing experience y'all. Get ready.